Spending time outside during the summer is a great way for you and your dog to get exercise and have fun together. 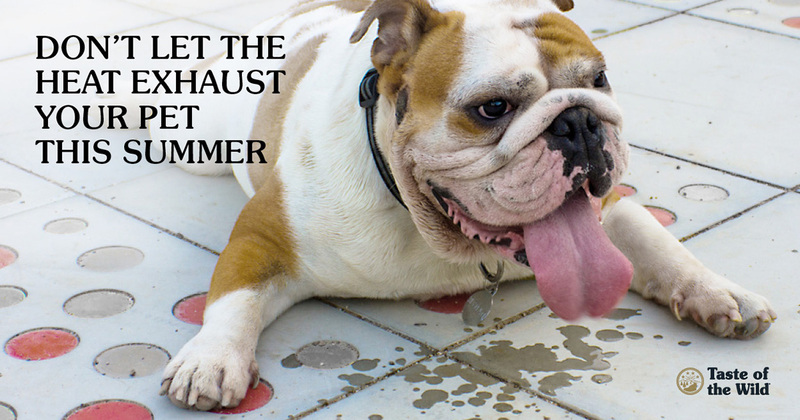 But hot, humid weather can make anyone uncomfortable, and that’s especially true for your canine companion. In fact, according to information from Nationwide Pet Insurance (formerly Veterinary Pet Insurance), summer weather may mean more trips to the veterinary clinic for your fur-covered friend. That’s because outdoor activities during soaring summer temperatures can lead to dehydration, sunburn, burned paw pads, heat exhaustion (heat stress) and heatstroke for dogs. Read on to learn more about heat exhaustion and heatstroke, two potentially life-threatening conditions that may be prevented if precautions are taken. Heat exhaustion and heatstroke occur when dogs become severely overheated as a result of inadequate cooling. Conditions such as working or playing too hard during hot, humid weather, overexposure to the sun without enough shade or water, or — most commonly — being left alone in a parked car with little ventilation can cause dogs to overheat. Since they cannot sweat like we do, dogs release body heat by panting and through the blood vessels of their skin. Panting is a less efficient way to cool down than sweating. If a dog can’t pant quickly enough or if the environmental temperature or humidity is high, a dog’s body temperature can rise rapidly to dangerous levels. If signs of overheating are seen, you must take action immediately. Left untreated, your dog’s body temperature will continue to rise — damaging the brain, heart, kidneys, muscles and other body systems — and could be fatal. Move your dog out of the hot environment and into an air-conditioned area if available. Lay your pet on a cool surface, such as a tile floor, and direct a fan on them. Offer cool, but not ice cold, water for your dog to drink. But don’t force water into your dog’s mouth if they don’t drink. Take your dog’s rectal temperature. If their temperature is greater than 104 degrees Fahrenheit, place cool, wet towels over the back of their neck, in their armpits and on their groin area. Wet their earflaps and paws with cool water. Continue to check your dog’s rectal temperature and stop cooling measures when it drops to 103 degrees Fahrenheit to avoid overcooling your pet. Transport your dog to the nearest veterinary clinic for evaluation and additional treatment. Luckily, preventing heatstroke is much easier (and safer) than treating it. Here are six commonsense steps you can take to prevent heatstroke. Never, ever leave your dog alone in a parked car. During warm weather, interior vehicle temperatures can reach dangerous levels within 20 minutes. And cracking windows open and parking in the shade won’t make much difference inside your car. So while your dog might love car rides with you, they may be better off at home during hot weather. Provide plenty of shade for outdoor dogs. Have a comfortable, sheltered area available so your dog can get out of the sun. Keep in mind, too, that a morning shady spot can be scorching hot later in the day. Provide lots of fresh, cool water. Whether inside or out, your dog needs access to fresh, cool water. Panting cools your dog through moisture evaporation from the tongue, airways and lungs. This water needs to be replaced or your dog can become dehydrated. Know the risks for certain dog breeds or those with health issues. Older dogs and those with heart disease, breathing problems or extra weight can easily overheat. Short-faced or snub-nosed (brachycephalic) dogs, such as Boston terriers, bulldogs, pugs and Pekingese, are far more prone to overheating than other breeds because they typically can’t breathe well. For any dog with health issues, even normal activities during hot weather can be dangerous. Save outdoor time for early mornings or evenings after sunset. Your dog still needs exercise during the summer, but you’ll want to avoid walking your dog midday when heat and humidity can be at their worst. Consider walking your dog early in the morning or after sunset when it’s cooler. Limit exercise on hot days. Depending on where you live, there may be days when it is simply too hot or humid for outdoor activities. Consider playing games with your dog inside, space permitting, or scheduling a visit to a local doggy daycare. We all want to have fun outdoors and enjoy fresh air and sunshine. The good news is that serious heat-related health problems such as heat exhaustion and heatstroke can be avoided.